I've been pulling on an intellectual string for a while and this year it really started to come loose for me. That string ended up being connected to the study of human psychology. I'm going to release my 2017 reading list on Monday and it will feature a number of books in this topic area. It's so important to what we're doing here at Strong Towns. It's filled in a lot of empty space in my thinking. The Curbside Chat, the presentation of our core insights at Strong Towns, continues to evolve as a narrative. This year I added a brief set of insights from behavioral science to explain the transition from the complex, adaptive nature of the Traditional Development Pattern to the hubris of the Suburban Experiment. Are we fundamentally different people now? No, of course not, we're just freed of the constraints of the past. Psychologists call this temporal discounting. Humans are predisposed to highly value pleasure today and to deeply discount future pain, especially the more distant it is. It's easy today to rationalize that future expense, especially when you feel so assured that new growth will make those future people better off. This thinking is how you end up with two dollars of public infrastructure for every one dollar of private investment. This is how you spend yourself into bankruptcy. This isn't a political, cultural or social failing. As humans, we're wired to act this way. Modernity removed most physical restraints, government removed the financial, and we did the rest. I love watching people's faces when I explain this during a Chat event. I watch the conversation cut through all those biases we've built up — the left/right, urban/rural, educated/ignorant, etc. paradigms we've allowed ourselves to be defined by and have defined each other with — and help people appreciate that our current set of problems are human failings. A shared experience. We are human, so human. Lafayette, Louisiana, has a population of around 125,000 people. That makes it about the 200th largest city in the country; not terribly big but not all that small either. It has a unique culture and geography, but its layout and design are very typical of American cities. Get outside of the core downtown and surrounding neighborhoods to visit the strip malls, big box stores and residential subdivisions and Lafayette looks like any other city you'd pass through. I stress its unremarkable nature not to denigrate it in any way — I love the city and I have a special fondness for the people of Lafayette — but to help connect you, the reader, to a shared plight. With the exception of a small handful of North American cities (literally five or less) Lafayette provides an insight into why every city — yours included — has no money. Problems have solutions. Predicaments have outcomes. What is happening in Lafayette is not a problem; it's a predicament. Along with my good friends and colleagues Joe Minicozzi and Josh McCarty of Urban 3, I was invited to work with the city of Lafayette to help them get a handle on why they could not keep up with maintaining their infrastructure. Through a strange path, the city had found itself with a lawyer turned newspaper reporter — a really sharp guy named Kevin Blanchard — as their public works director. Questions that previous directors had found inconvenient to ask were now front and center because of Kevin. Like most cities, Lafayette had the written reports detailing an enormous backlog of infrastructure maintenance. At the current spending rates, roads were going bad faster than they could be repaired. With aggressive tax increases, the rate of failure could be slowed, but not reversed. The story underground was even worse. Ironically, this news had historically been the rationale for building even more infrastructure, with that theory that this is a problem we'll grow our way out of. That didn't make sense to Kevin or to the city's mayor — a guy named Joey Durel. Joe Minicozzi, Josh McCarty and I interviewed all the city's department heads and key staff. We gathered as much data as we could (they had a lot). 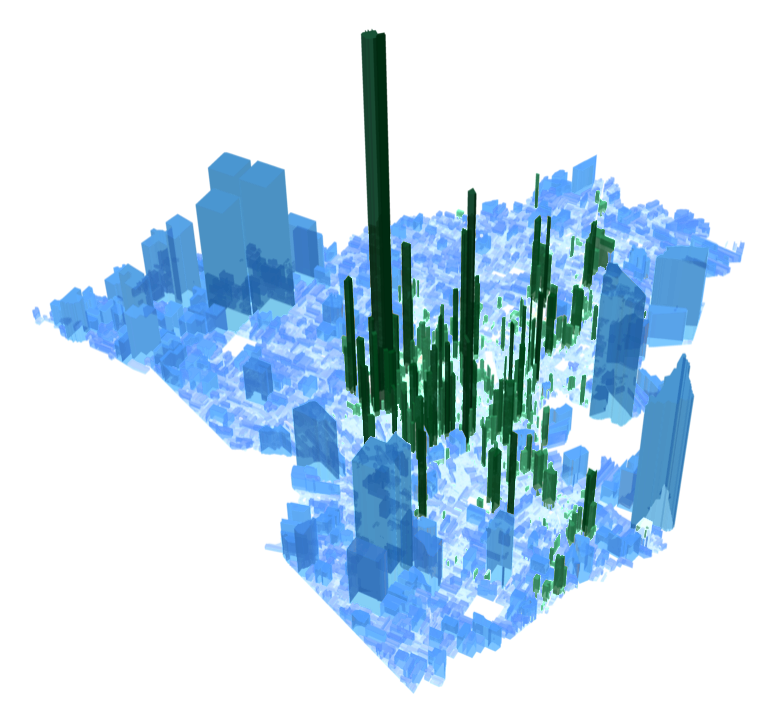 We analyzed and then mapped out all of the city's revenue streams by parcel. We then did the same for all of the city's expenses. This was the most comprehensive geographic analysis of a city's finances that I've ever seen completed. When we finished, we had a three dimensional map showing what parts of the city generated more revenue than expense (in business terms, this would be called profit) and what parts of the city generated more expense than revenue (again, in business terms, this is considered a loss). Here's that map. In accounting terms, green equals profit and red equals loss. The higher the block goes, the larger the amount of profit/loss. If you have a sense of the basic layout of North American cities post World War II (a compact downtown in the center and suburbans-style development on the edges), you can figure out pretty easily what is going on here. There are some remarkable things to note right off the top. When we added up the replacement cost of all of the city's infrastructure — an expense we would anticipate them cumulatively experiencing roughly once a generation — it came to $32 billion. When we added up the entire tax base of the city, all of the private wealth sustained by that infrastructure, it came to just $16 billion. This is fatal. Let me explain: The median house in Lafayette costs roughly $150,000. A family living in this house would currently pay about $1,500 per year in taxes to the local government of which 10% (approximately $150) goes to maintenance of infrastructure (more is paid to the schools and regional government). A fraction of that $150 — it varies by year — is spent on actual pavement. To maintain just the roads and drainage systems that have already been built, the family in that median house would need to have their taxes increase by $3,300 per year. That assumes no new roads are built and existing roadways are not widened or substantively improved. That is $3,300 in additional local taxes just to tread water. That does not include underground utilities — sewer and water — or major facilities such as treatment plants, water towers and public buildings. Using ratios we’ve experienced from other communities, it is likely that the total infrastructure revenue gap for that median home is closer to $8,000 per year. The median household income in Lafayette is $41,000. With the wealth that has been created by all this infrastructure investment, a median family living in the median house would need to have their city taxes go from $1,500 per year to $9,200 per year. In other words, to just take care of what they now have, one out of every five dollars this family makes would need to go to fixing roads, ditches and pipes. That will never happen. Thus, Lafayette has a predicament. Infrastructure was supposed to serve them. Now they serve it. All of the programs and incentives put in place by the federal and state governments to induce higher levels of growth by building more infrastructure have made the city of Lafayette functionally insolvent. Lafayette has collectively made more promises than it can keep (and it's not even close). If they operated on accrual accounting — where you account for your long term liabilities — instead of a cash basis — where you don't — they would have been bankrupt decades ago. This is a pattern we see in every city we've examined. It is a byproduct of the American pattern of development we adopted everywhere after World War II. The way this happened is pretty simple. At Strong Towns, we call it the Growth Ponzi Scheme. Through a combination of federal incentives, state programs and private capital, cities were able to rapidly grow by expanding horizontally. This provided the local government with the immediate revenues that come from new growth — permit fees, utility fees, property tax increases, and sales tax — and, in exchange, the city takes on the long term responsibility of servicing and maintaining all the new infrastructure. The money comes in handy in the present while the future obligation is, well... a long time in the future. So what do we do now? Well, we may be about to create a huge pot of money at the federal level that we can spread around to try and solve this problem. Only, it's not a problem. It's a predicament; it has no solution, only outcomes. It's a predicament that nearly every American city finds itself in. Even if there was enough wealth and productivity to fix all of this — and there isn't anything close to that amount — we would be fools to spend it so unproductively. All of this infrastructure is a bad investment. America needs a different model of growth and development. In the next article, I'm going to show how the poor are financially propping up our cities and how, once we understand that, we can start making low risk investments that actually make us wealthier as a country while also improving our quality of life. Read the follow-up article, "Poor Neighborhoods Make the Best Investments." The phrase "value capture" has been tossed around a lot lately. Here's what it does and doesn't mean. A review of the White House infrastructure plan reveals a few rough spots, but also a lot to like. In times like this, where we're asking cities to innovate and to do more with less, we should be adding tools to the local government toolbox, not removing them.